Next time you are about to throw away a load of fruit that’s past its best – think again. Just because it is too soft, brown or wrinkly to eat raw, doesn’t mean it’s ready for the compost bucket. Peel, chop and throw in whatever sad looking bits of fruit you have laying around. 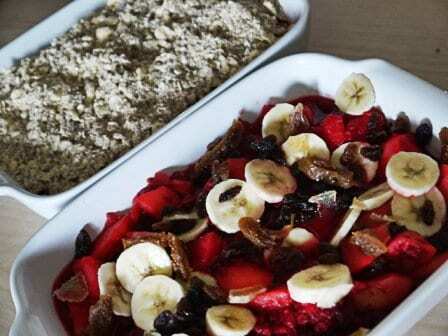 Apples, pears, mangoes, bananas, pineapple, oranges, grapes – throw ’em all in a baking dish. If it looks a bit boring, raid your dried fruit & nut stash too. I added a couple of cubes of thinly sliced crystallised ginger, sliced dried figs, sultanas and a handful of mixed nuts. I usually have some fruit lurking in the freezer too, this time I used up a bag of frozen raspberries that have been in there for (dare I tell you the truth?) years. Ahem. I cooked my apples & berries down a bit first (to defrost the berries & as there were so many apples, they may not have fitted in the crumble dish) but you don’t need to do this. Stir in the oats and sugar, mixing well. 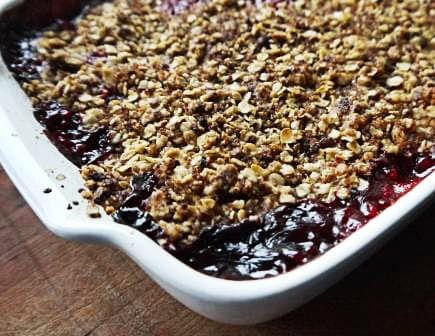 Tip it out over your dish of fruit, and bake at 180C/350F/Gas 4 until the topping is browned, oozy and stained by the juicy fruitiness underneath. 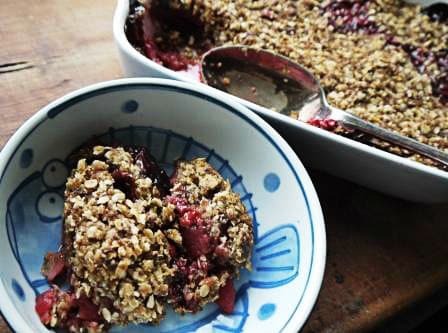 We do love crumble. The debate about whether it’s better with ice cream, cream or custard has never been resolved, but we can’t wait to try out this recipe. 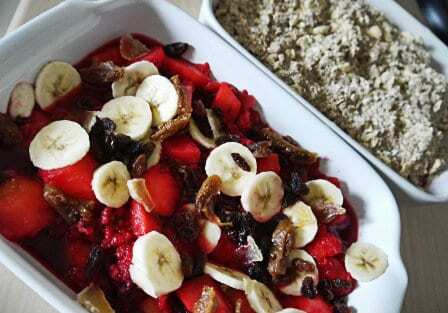 It’s a fantastic idea for using up fruit that might otherwise be thrown away. Hi Laurie, it is a mighty fine topping, I think it’s the oats added. Enjoy!